Since their launch last year, users have created more than 56,000 collections of add-ons. 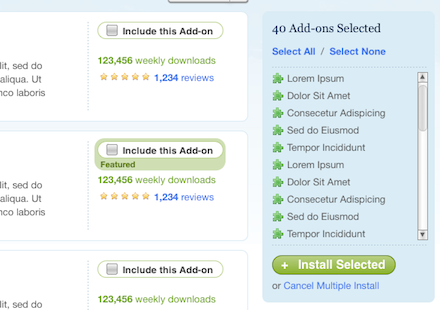 Collections and user reviews are the two ways in which everyday users can contribute content to the add-ons site. I’ve been thinking about ways to improve collections since last year, especially as many other sites now support similar groups of content. Facebook has groups of friends, Twitter has lists of followers, Youtube has playlists of videos, and we have collections of add-ons. We’re a bit different though: collections were designed primarily as a sharing vehicle, which is why we have a public directory listing them when other sites don’t. But one thing I really love about others’ list features is their simplicity of creation and management. We’re well underway in rewriting addons.mozilla.org in Django, so now is the perfect time to make some improvements to the feature as we rewrite it for the new site. With the goals of making collections easier to create and manage, using them to power other features across the site, and making them more personal, here are a few changes in store for collections in the coming months. Probably the most common reason people create collections is to keep track of their favorite add-ons. We’ve discussed the idea of letting users “favorite” add-ons for years and launched the Rock Your Firefox Facebook application in 2007 to let users do just that, though the functionality never made its way to AMO proper. Collections are a great way to keep track of favorites, and we can do a few things to make managing these favorites a lot easier. Each user with an account will automatically have a Favorites collection created for them, and add-on details and browse pages will have links to quickly add or remove add-ons from that collection. Of course, you’ll still be able to create collections the old way and specify additional settings. 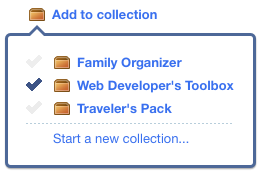 When we launched collections, we also introduced the Add-on Collector extension that lets anyone subscribe to their favorite collections and get notifications in Firefox when new add-ons are added to a collection. It’s about time we brought that functionality to the website itself. Instead of adding a collection to your favorites and then becoming a “subscriber” as currently happens, we want to change the terminology to “watching” a collection. Once you start watching collections, you’ll be able to see any activity on those collections in a central place and can subscribe to updates through an RSS feed. Collections will have a single owner and will be accessed through a URL under that user’s namespace. For example, /collection/myfavoriteaddons12345 can now just be /collections/fligtar/favorites. This also means collection URL slugs can be automatically generated but still editable, like in WordPress. 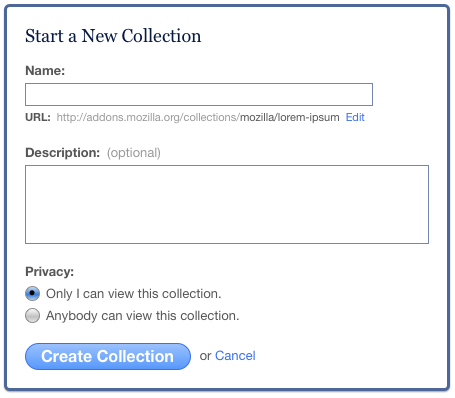 Collections can still have contributors that can publish add-ons to a collection. Privacy options will be simplified into completely public collections and collections that only the owner can view while logged-in. These changes should make collections a lot easier to create and understand. Multiple installations will be surfaced through a link at the top of collections that switch into a multi-install mode, where install buttons become checkboxes and a running tally of your selected add-ons appears on the right. We’re also considering the idea of a configurable option that indicates a collection is meant to be installed as a set, such as a collection of add-ons to make your browser look like Firefox 4. Collections that choose this option would have an “Add All to Firefox” button and avoid going through the selection process. 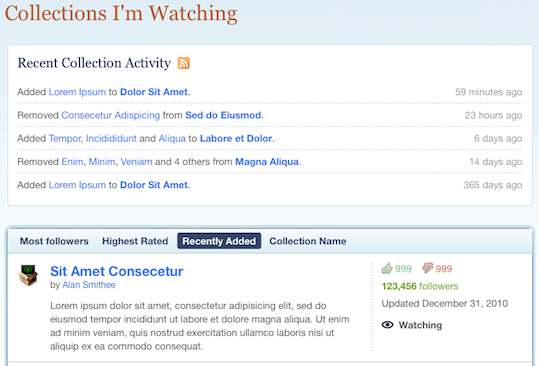 In addition to these new features, all of the collections-related pages will be getting a facelift. You can see all of the new designs by Chris Howse here. For the full list of planned features and changes, read the spec.